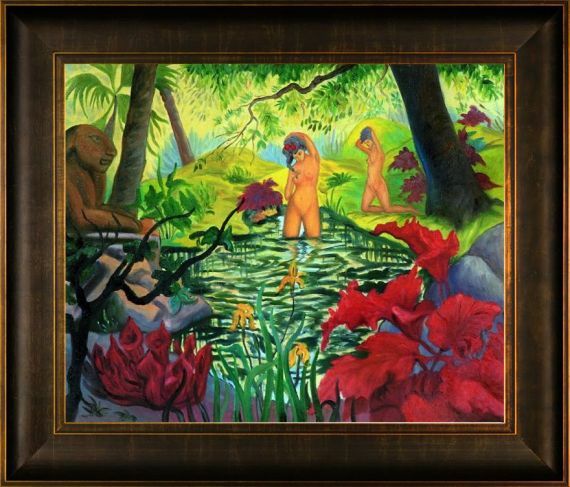 Florentine Dark Champagne Frame 20"X24"
20" X 24" Oil Painting On Canvas Hand painted oil reproduction of a famous post-impressionists painting by Paul-Elie Ranson, The Bathing Place or Lotus (or il bagno). Today it has been carefully recreated detail by detail, color by color to near perfection. 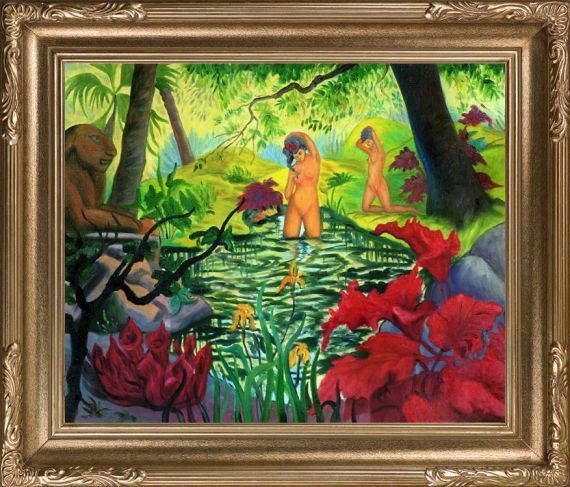 Paul Ranson (1864 - 1909) was a French painter and writer. He was was born in Limoges and studied at the Ecole des Arts Decoratifs there before moving to Paris and transferring to the Academie Julian in 1886. There he met Paul Serusier in 1888. Subsequently from 1890 he became a member and a creative leader of the Nabis group. Les Nabis (prophets) were a group of post-impressionist avant-garde artists that set pace for fine arts and graphic arts in France in the 1890's. They preached that a work of art is the end product and the visual expression of an artist's synthesis of nature in personal aesthetic metaphors and symbols. They paved the way for the early 20th century development of abstract and non-representational art. In 1908, he created the Academie Ranson with his wife Marie-France, to teach the Nabi ideas and techniques. After his death in Paris in 1909, his wife continued to run the academy.